Go back and catch up with Part #1 of the build! Part #2 | basic modelling..
My favourite gap-filling putty has to be Squadron's white putty due to its fine consistency, fast-drying and finishing characteristics. I dispense a small dollop at a time and spread it with a sculpting spatula tool. Before I spread the putty, I use masking tape to mask (and / or) protect the surrounding area so as to avoid damaging detail. Now I spread the putty along the seam while pushing and smoothing the white putty in the gap with the small spatula. 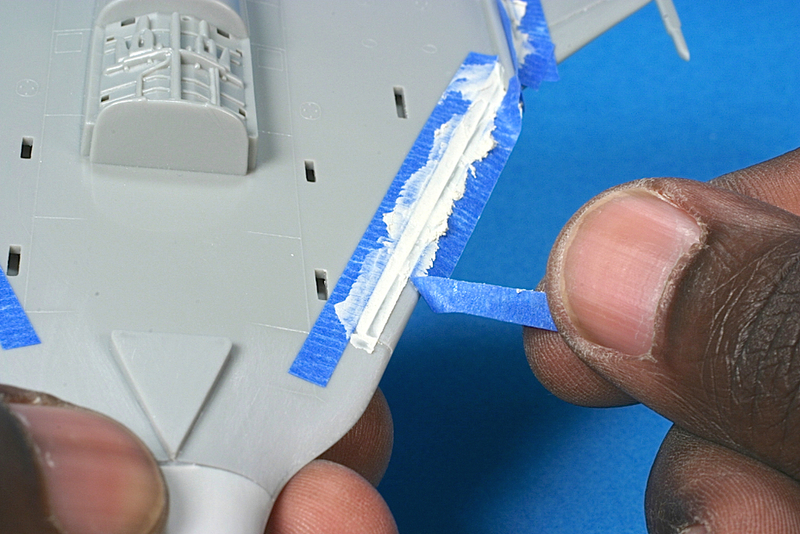 Tip: If you find the putty is drying to fast as you work; Squadron putty can be thinned with nail polish remover to keep the putty workable as you work. Well use the nail polish again in another technique..read on. After letting the putty dry for 10-15 min I removed the masking tape. Pull the tape away from the edge (not straight up). 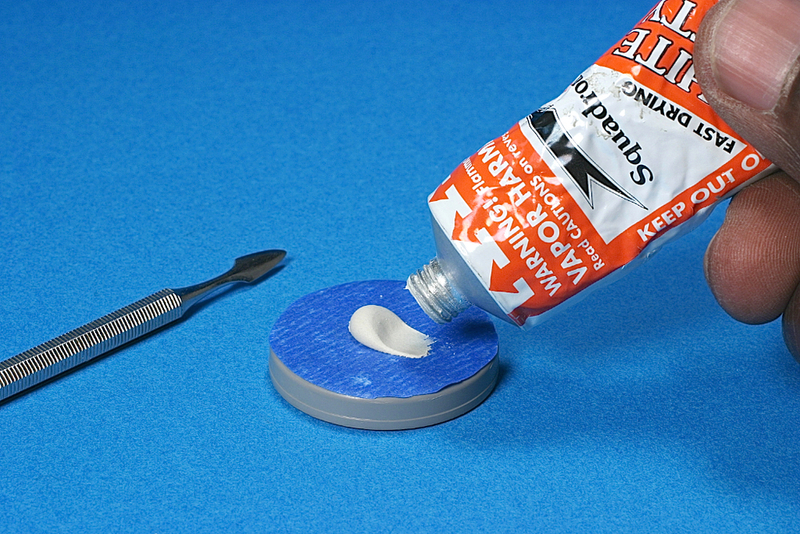 This will avoid pulling away the setting putty from the filled gap. The result of careful tape removal, leaving a neat edge and surrounding detail is undisturbed. Now it's time to smooth the gap and blend with the model surface. Here's where the nail polish remover comes in again. This time I use it to smooth the puttied area, effectively blending and fairing the seam with the surrounding surface. Nail polish remover thins the putty well. Soak the tip of a cotton swap and wipe over the puttied seam to begin smoothing. Continue with cotton swabs soaked in nail polish remover along the length of the seam. The key is to smooth the putty out across the seam with light pressure to avoid removing too much putty from the gap. As you smooth the putty, the cotton swab will get caked with putty. Use fresh swabs as needed until finished. I repeated the process for a small gap on the rudder.. When done carefully; taking your time using this method, you may find you can avoid using traditional sanding. As was the case here. 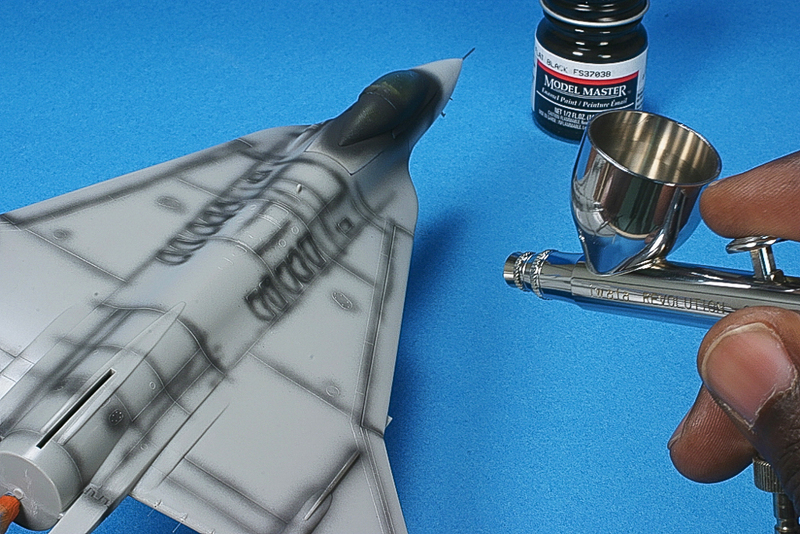 After painting the intake interior white, I set it aside to await the main fuselage colours where I will apply the standard USAF grey scheme. Now on to other details, such as static discharger whips. Using the needle I start the hole where I'll insert the invisible thread whip. After locating where the whip is supposed to be, I carefully press the sharp needle to create an indention start a drill hole. After starting the whole, I use the pin-vice to drill tiny holes where I'll insert small strands of the invisible thread. Ready to insert the whips..
With the tiny holes drilled out, I'm ready to insert tiny strands of the invisible thread with tiny drops of superglue. I clip off 1/2 inch small strands of invisible thread for the whips. I don't worry about measuring the exact length at this time..I usually install and cut to length after installation because it's easier. 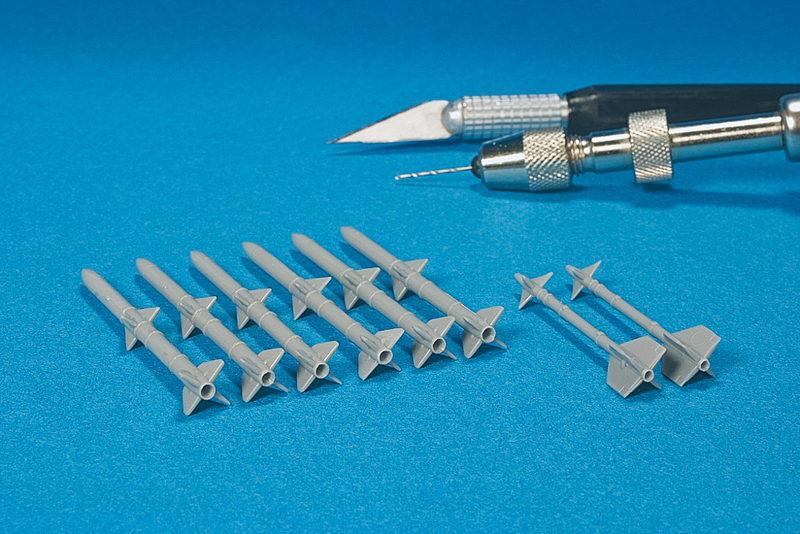 To install the strands of invisible thread, I dip one end of the thread in a small pool of superglue, then insert it inside the drilled holes. I take care to position them so that the strands are straight/ level, etc. then set them in place with a tiny drop of superglue accelerator. After installing the whips in place, I now trim the strands to length with small scissors. I simply refer to reference photos, and literature for proper length translated to 1/72 scale. When all else fails, rely on what looks visually correct to your eye compared to photos. After trimming the strands to length, the static dischargers are complete. 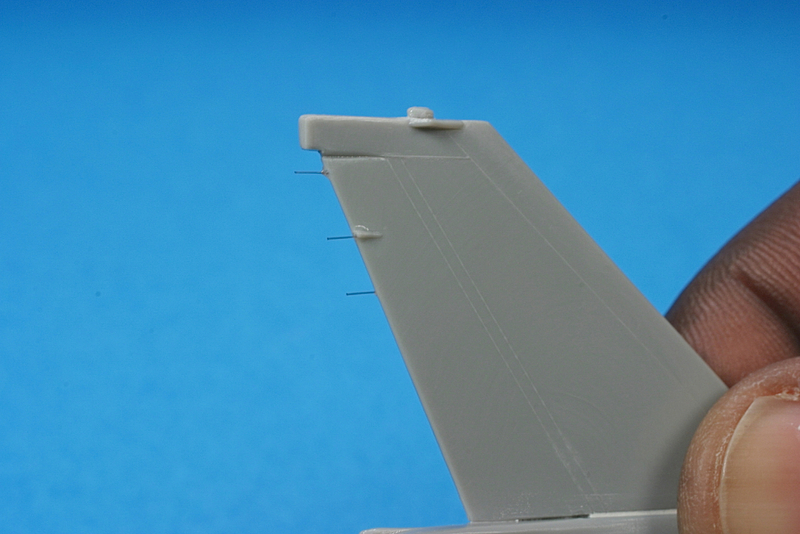 I repeat the same process for the main wing trailing edges. Go ahead, run your finger along the whips; they're flexible, so the won't break off! Here, a look at the completed whips along the length of the main wings. To simulate a realistic nozzle opening, I use my sharp hobby blade to reem-out the hole and thin the nozzle edge. No detailing here, just basic assembly. Liquid cement was used and clamped with clothespins and allowed to cure. 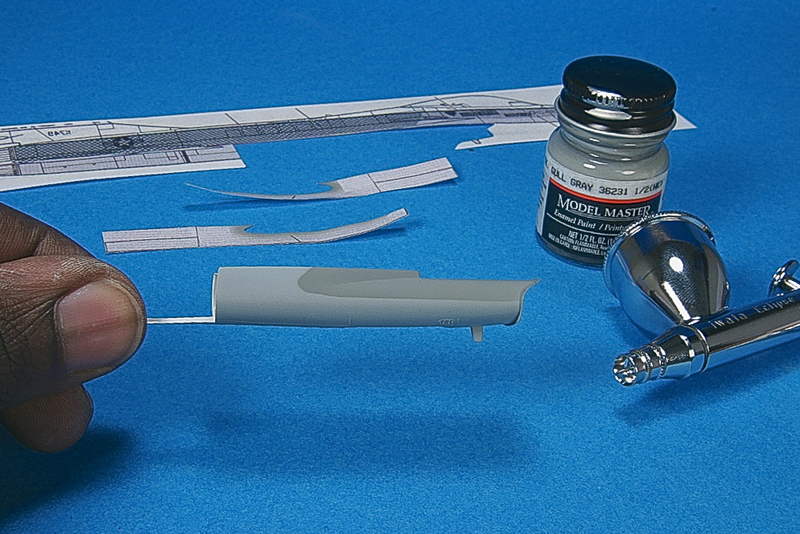 The missiles now appear with realistic rocket nozzles and are now ready for painting and finishing. The method I use is to first paint the wheels the appropriate colour Flat Black or Tire Black, then mask the tire areas leaving the hub exposed to airbrush Gloss White. 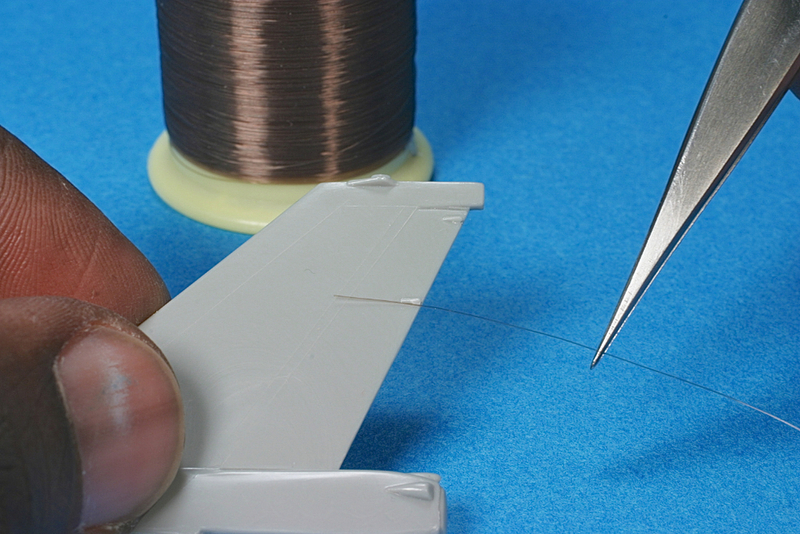 Parafilm M, a pair of scissors and a sharp hobby knife are needed. To begin, I cut off a 1-inch section of Parafilm-M and remove the paper backing. 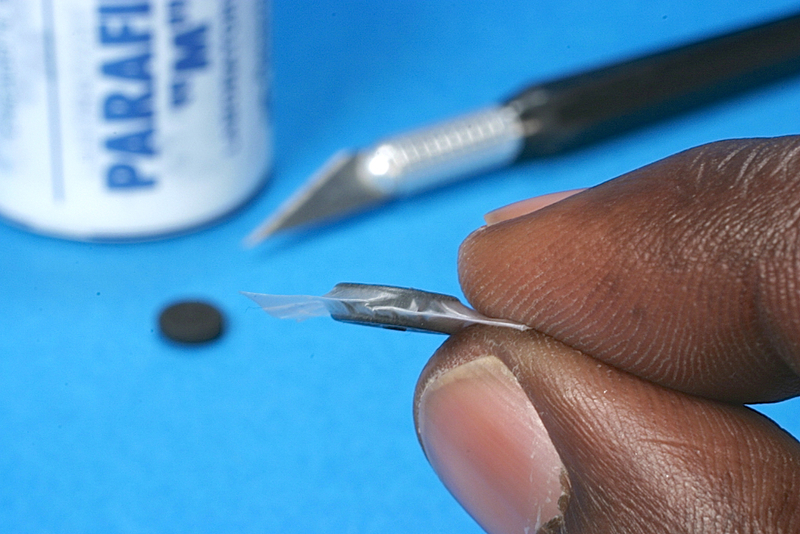 To activate Parafilm's adhesive properties, it needs to be stretched out until taught and then set aside for 20-30 sec. 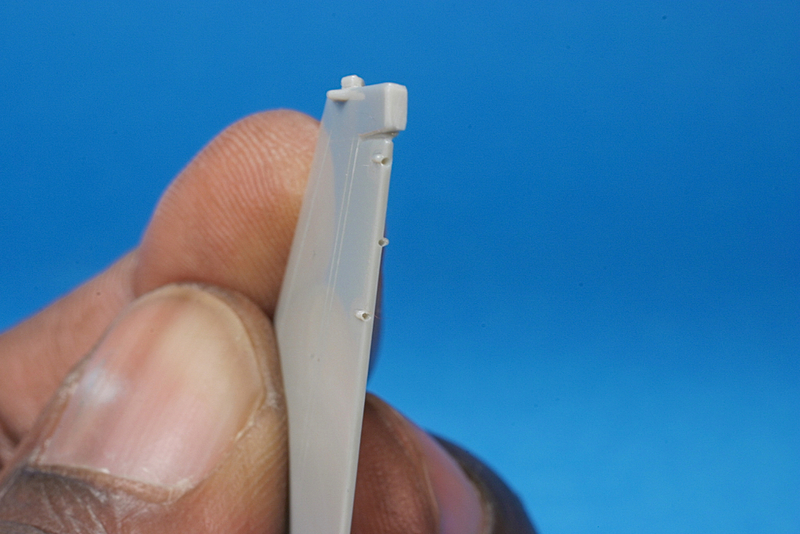 Parafilm's adhesive is non-residual and leaves no sticky film after removal, ideal for scale modelling. The idea is to sandwich the wheel between the top and bottom layer of Parafilm. 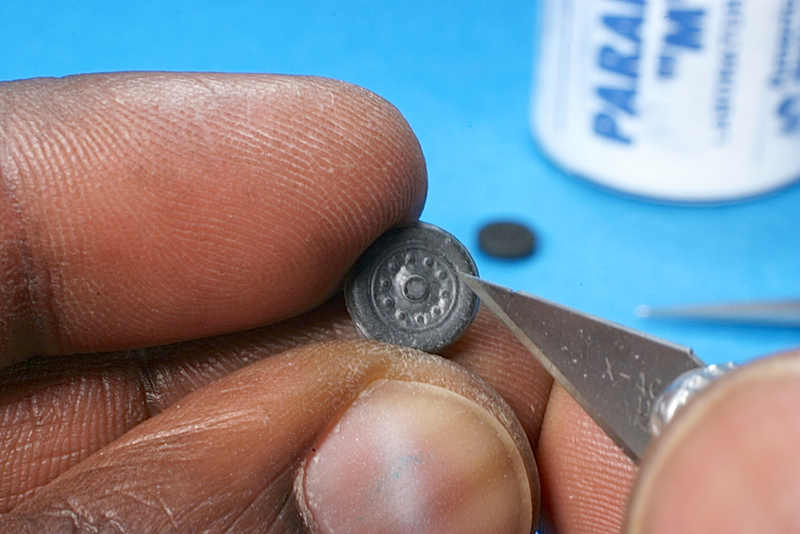 Using your finger, press the Parafilm into Wheel and the hub details, etc. No burnishing tool are recommended, as they can possible rip/ tear the film. 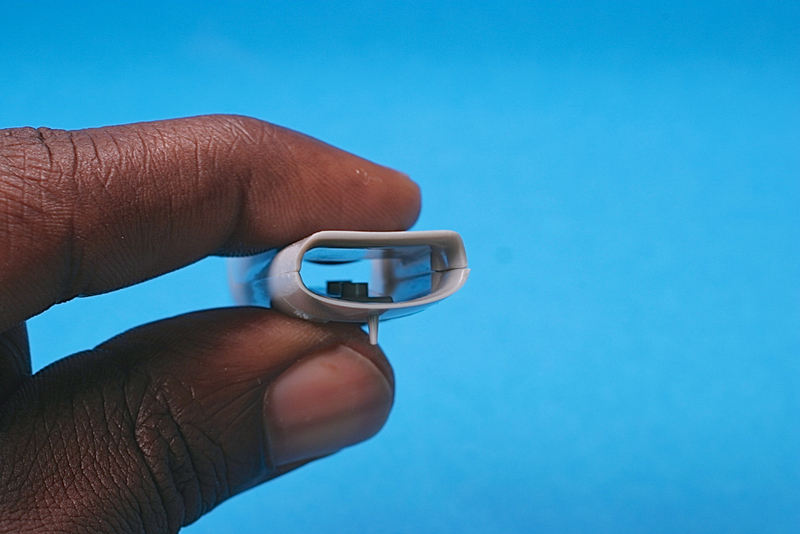 Here you can see the wheel covered or sandwiched between the Parafilm. I simply use the scissors to cut away excess film not needed. Now with the tire covered with Parafilm, I use a sharp number #11 blade in my hobby knife to cut around the hub. 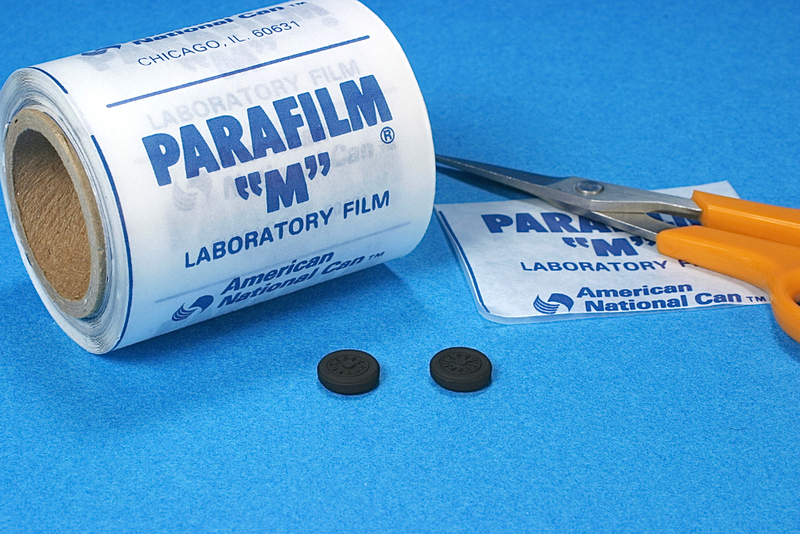 When we rubbed the Parafilm down with our fingers, the translucent Parafilm material reveals details well, allowing us to see where where we need to trim. 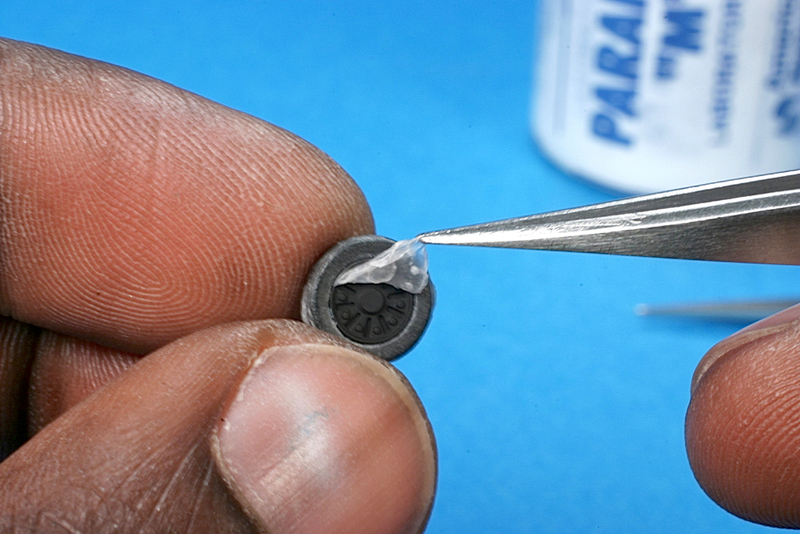 After trimming around the hub with the hobby knife, you can carefully lift the Parafilm away from the area, leaving the hub exposed. 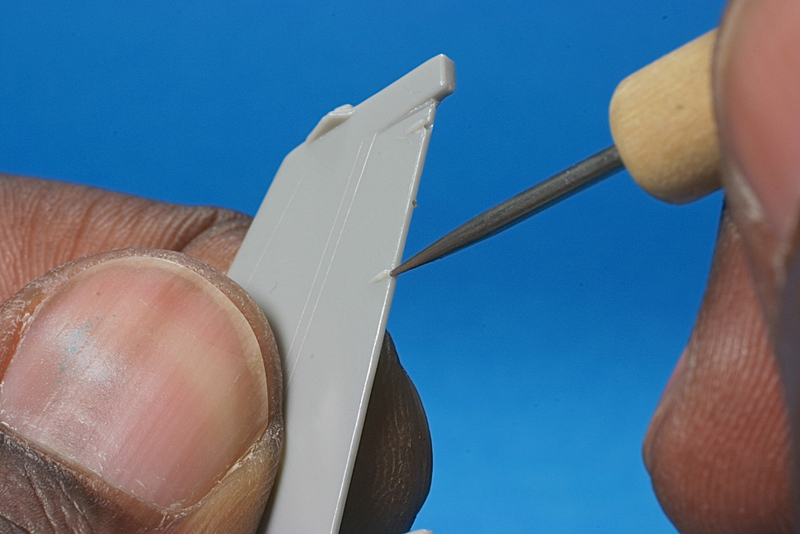 If you find that you didn't slice through the Parafilm around the hub well enough, carefully do so with the tip of the hobby knife and it should come away cleanly. Now you should have the the wheel hub exposed with a clean, sharp mask over the wheel tire area. 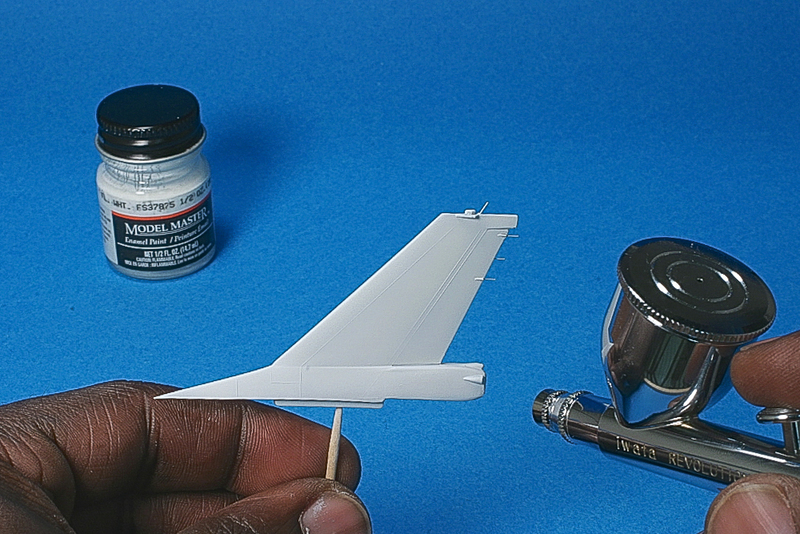 Now its time to airbrush the hub Gloss White (in the case of most USAF jets). This method is ideal for airbrushing because, brush painting could possibly disturb the Parafilm-M and lift the masking material from the tire, creating more chance of a sloppy painted edge. After a few coats of Gloss white I allowed them to dry over night or for at least several hours with Tamiya acrylics. 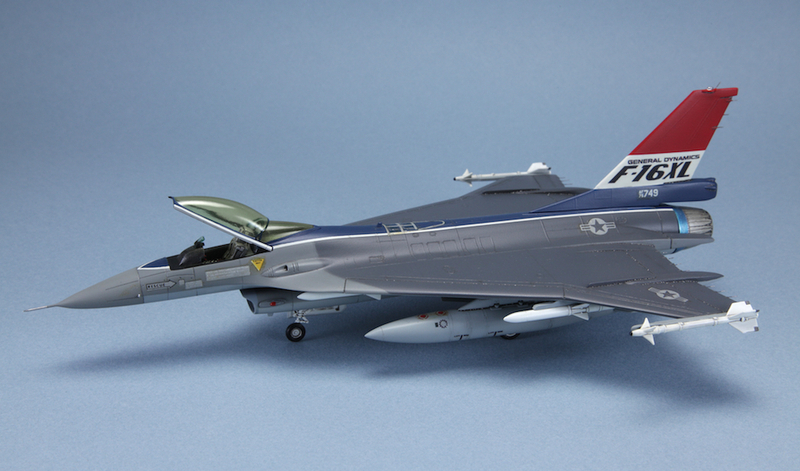 I then airbrushed a few thin layers of Future floor finish- also allowed to dry and applied a weathering wash.
With our new "open-canopy" F-16XL, I wanted to simulate the tinted appearance seen on most F-16s. The canopy that came with the kit was tinted "smoke." I didn't want to simply recreate that look, I wanted to go for a more gold-ish appearance. 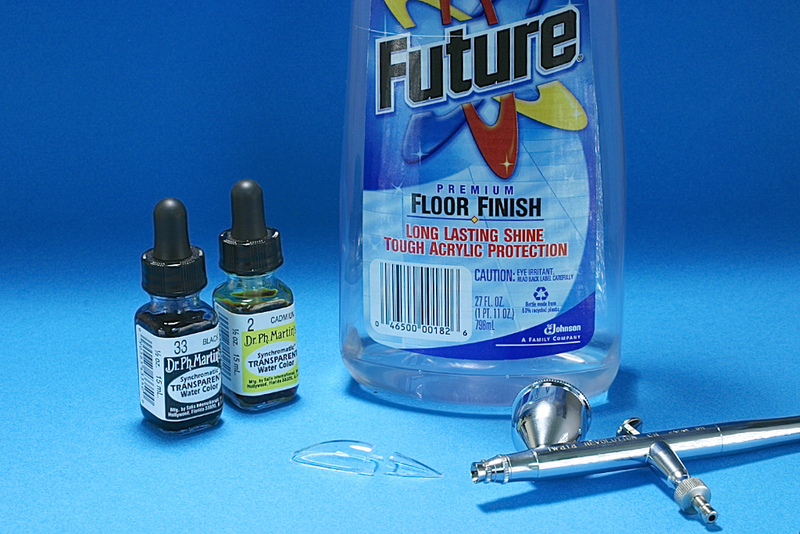 To do this, I often use Future floor finish (AKA: Pledge floor care finish, Pledge with future shine, or Klear) with food colouring or better; a selection of artist water colors. The type I have found to work well for mixing with Future floor finish and tinting canopies are Dr. Ph. Martin brand transparent water colours. They are available in single colours or a pack of standard colours from black to greens. I'll go through my technique below to show how I tint my aircraft canopies. For a gold/ smoked canopy I chose black and yellow transparent water colours. I'll need to mix these with the Future floor finish and airbrush this mix on the canopy plastic in thin layers. I have found that I prefer airbrushing because it gives me superior results as apposed to dipping or brushing that can leave brush strokes and or uneven pooling/ dripping of the tinted Future mix. Instead I typically get thin, even coats that are nearly crystal clear. To make the tint, I use a ratio of 1 eye-dropper full of Future to one drop each of the Black and Yellow transparent water colour. I use a Tamiya stir tool to thoroughly mix/ and blend it together. Use your eye to either add more or less colour to your taste. If you find that you added too much colour, add more Future to the mix. When the tint looks good to you, your ready to airbrush it on. Adjust your airbrush properly. 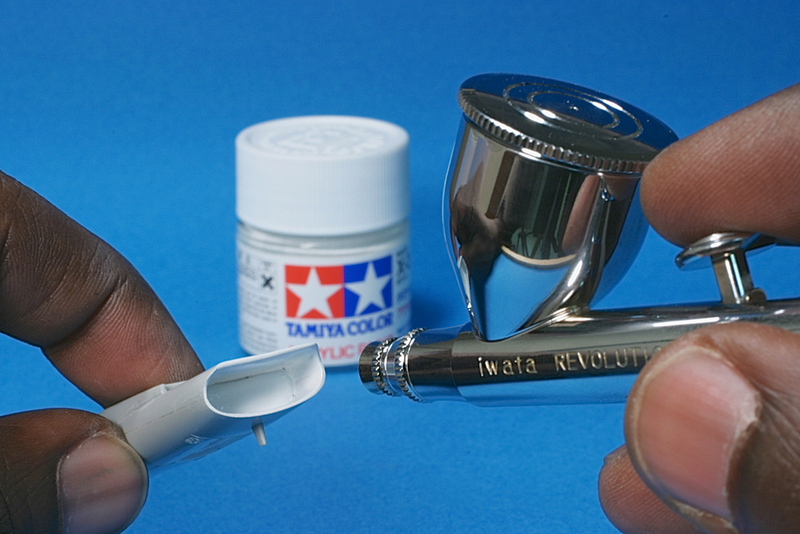 If you are using a gravity-feed airbrush such as this Iwata model, 10-15 psi is ideal. 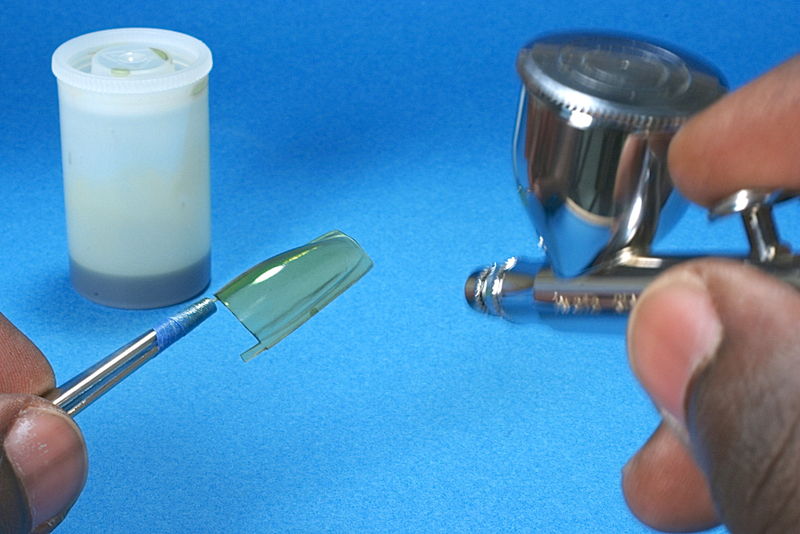 If your airbrush is a siphon-feed (colour cup on the bottom) adjust the psi to between 15-20 psi. This will aid in properly atomizing the paint or in this case or Future tint mix so it goes down on the canopy plastic in a slightly wet layer- not drying to fast or too slow...but just right. 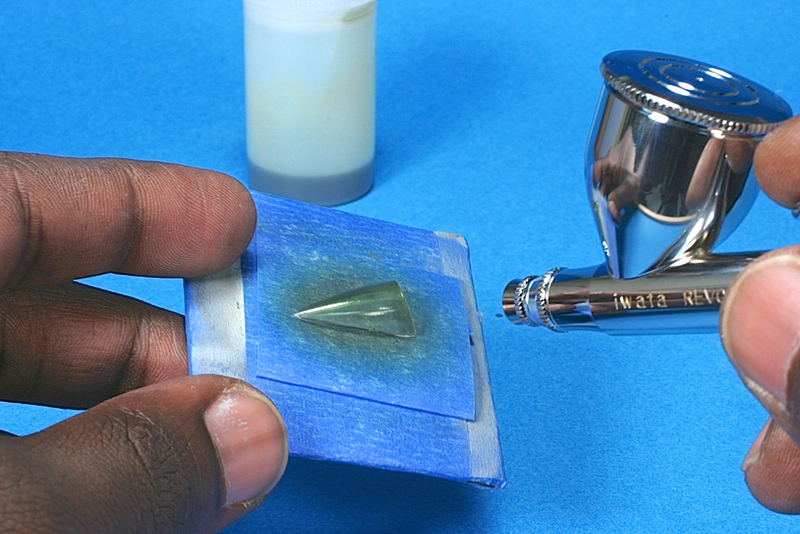 Airbrush it on with smooth passes and avoid stopping on the part to avoid pooling and dripping. Airbrush 1 to 2 thin coats and allow to dry for 10-15 min and reapply a few more thin layers and again allow it to dry. Lets not forget the rear canopy section.. Repeat the application with the airbrush and allow the canopies to dry in a dust free environment. Place them down on a glass surface with a bowel over-top is ideal. I start by pre shading with Flat Black. I attached the tinted canopy so I can airbrush the canopy framing in the same session. I take my time to airbrush as much of the panels, hatches, etc. as possible. After letting the pre shad dry for just 20 min. I cleaned the airbrush and loaded it with the first "lightest" color layer; Flat White. I could have used gloss but the flat paints dry faster and I don't have to wait days in-between colour layers. While I had the Flat White still loaded in the airbrush, I painted the white layer on the middle of tail fin. The next colour layer is the Light Ghost airbrushed to the underside. This second layer also serves double duty as a primer for the subsequent colours. I cut long thin strips of Tamiya tape and applied them over the white to represent the bold white striping. 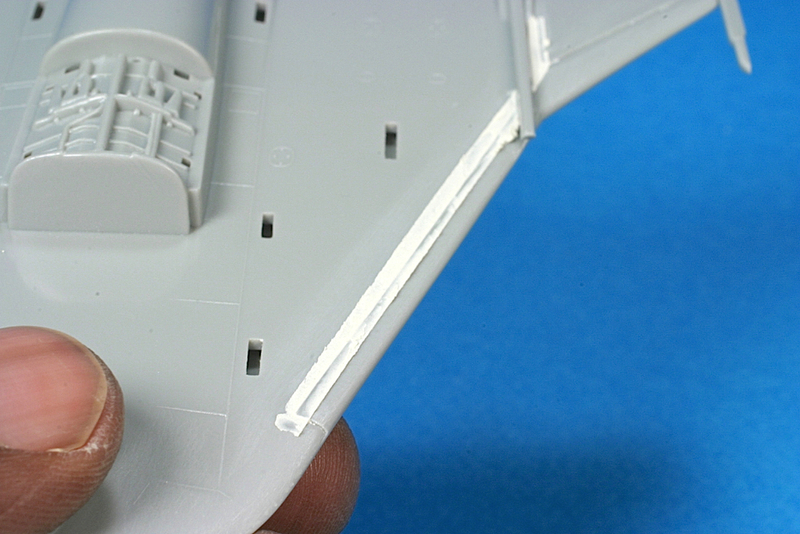 then I could continue airbrushing the Light Ghost on the upper forward fuselage area. Now with the white striping masked and the Light Ghost applied, I got right on to airbrushing the third layer, the Flat Blue along the spin of the upper fuselage. After letting the blue paint cure for an hour or so, it was time for the 4th colour, Gunship Grey. Before applying, I had to mask the blue areas and around the leading and trailing edges of the model to guard against unwanted overspray. I shifted gears and addressed the camo demarcation on the intake. To accomplish this I scanned the instruction sheet, sized it to 1/72 scale and used the cut-out of the pattern as a loose mask for airbrushing. 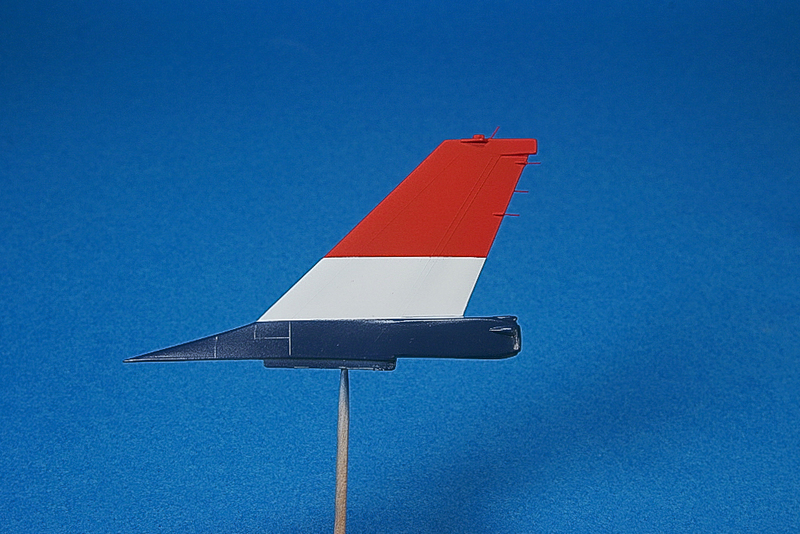 I went ahead and finished the tail by masking the blue and white and airbrushed the Flat Red to finish it off. Now its back to the main fuselage for the final Gunship Grey application. Using "loose masks" for airbrushing.. The fine-feathered demarcation line of the Gusnship Gray over the lighter is needed here. I repeated the same technique of using scanned instruction sheet, resized and camo pattern cut out for a loose mask while airbrushing. After the scanning and re-sizing, the camo pattern is cut out. I checked to make sure that the scanned pattern was the proper size before committing further. Things looked great, so I proceeded. Apply the cut out pattern and place it on the model with small rolled pieces of tape (folded on itself) or Blue Tack putty. Blue Tack is ideal as it is has a low adhesive stickiness and will not likely pull up the underlying colours from the model. I tend to use thin rolled pieces of Tamiya tape for this. Now I airbrush the final Gunship Grey. I spray away from the loose mask. I strive to aim the spray over the masked edge at 90 degree angle or perpendicular so as not to cause the paint to go under the mask to cause overspray. With the final layer applied and allowed to cure for a few hours, I can remove all masking to reveal and inspect our work for any touch ups, flaws, etc. All painting is complete. Here, the sub- assemblies are ready for final construction to complete the F-16XL. 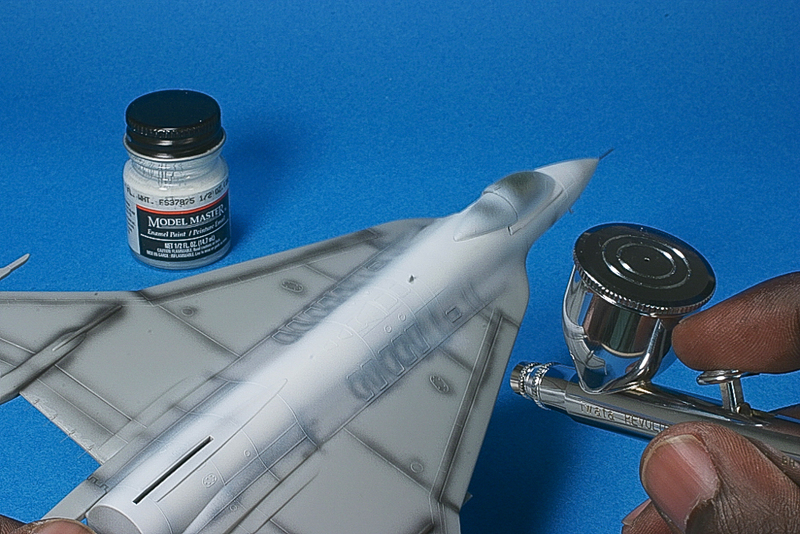 Now, after assembling the fighter, I apply a over-all gloss protective coat of Future floor finish to the model. This serves to protect the colour layers, prep for decaling and preps the surface for panel accent wash. I finished the model by applying the decals, accenting the panel lines and posing the new tinted canopy open. All missiles, ordnance, landing gear and jet exhaust can has been painted and installed. 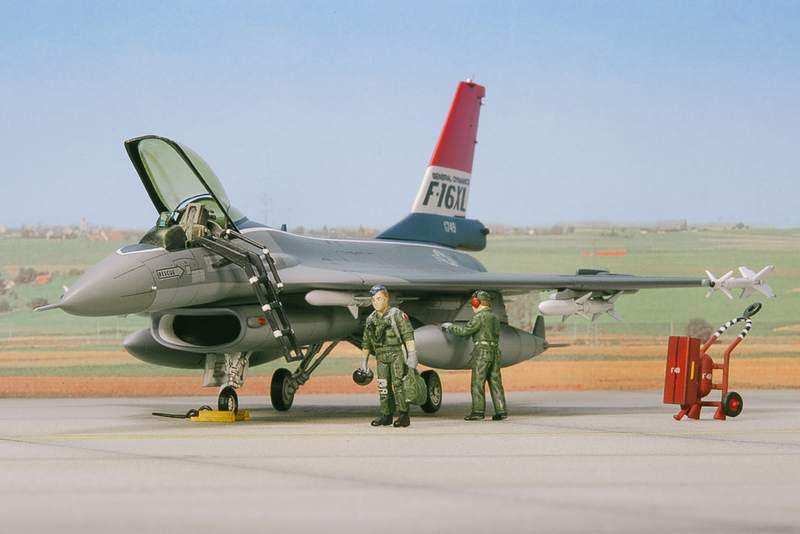 My new "open-canopy" F-16XL is ready to taxi to her place in my modern military aircraft collection. So, as you can see, with some basic and maybe a few advanced tips & techniques; you can turn what may have been headed for the trash to a model you wouldn't hesitate to put in a model show. I don't believe there is such a thing as a "bad kit." The kit manufacturers all do an amazing job at mastering model kits with awesome detail, choices of scale and subject variety, and decent fit in general. Where there is less than ideal fit, loss or lack of desired detail and accuracy; this is where the scale modeller comes in. It's up to us to make the model the best it can possibly be, only limited by his or her personal skill level and imagination. With that said, the kit gives us one heck of an amazing starting point. 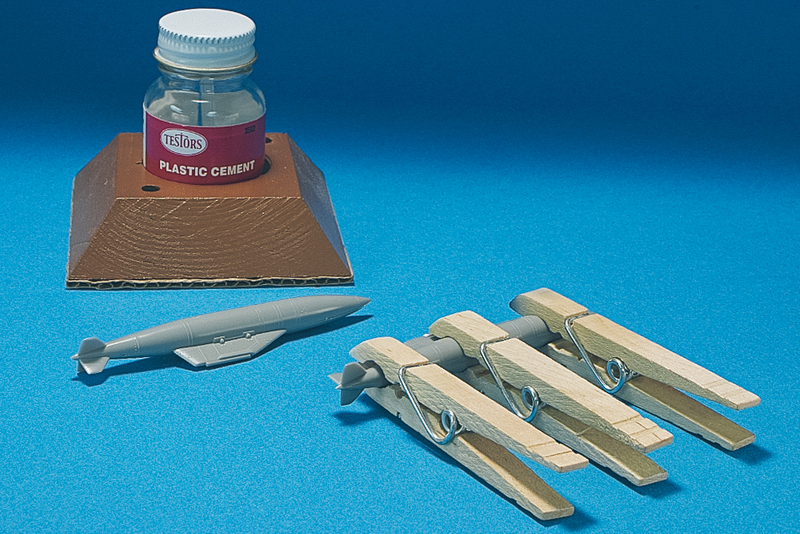 It is a skilled modeller who makes a great finished scale model, not the kit manufacturer. Anyway, I digress. 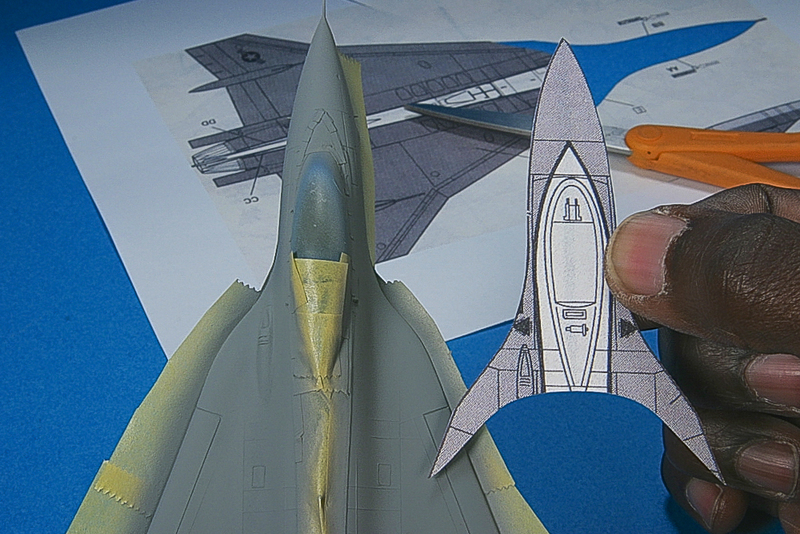 I hope you enjoyed following along as the F-16XL came together. I also hope that you found the tips and techniques used here useful for your own scale modelling! Tell me what you think; feel free to drop a comment or question or share a tip/ technique of your own.